Monday's lunch marks 20 days left on our advent countdown! The sandwiches are simple snowflakes - one large one and three small ones cut with my snowflake cookie cutters. The sandwiches are Biscoff Spread sandwiches. There are two beef & cheese bites added in the same area, with one of the pieces of cheese noting "20" for the advent countdown. Written with a Betty Crocker food writer pen. Top right are some sugar snap peas & organic baby carrots. Bottom right are mandarin oranges & red seedless grape halves. I love the large snowflake cookie cutter! Do you remember the brand on it? I started your countdown idea for my kids last Thursday and they love it. A little challenging for my 5-year-old, but a fun learning tool. Thanks so much! Colorful,love the veggies and fruits too! I love the colors too - kinda needed the punch since the sandwiches were plain, but oh so cute. :) Little Miss loved them when I showed her. Thanks Keeley for the Hobby Lobby tip! 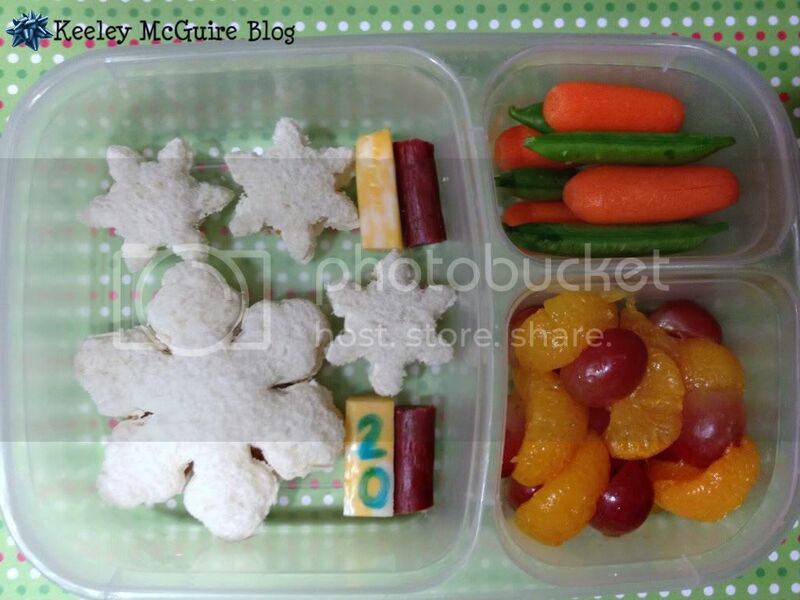 I am so appreciating the inspiration you give me to up the fun factor in my kids lunches!